LAMONI, Iowa — Jacob Irwin and Jason Kiehne won by pinfall, Clayton Fenzl started the dual with a comeback effort and the Simpson wrestling team cruised to 35-6 win Tuesday night. The Storm (1-1) won 8 of 10 matches to win their first dual meet of the young season. Simpson picked up six bonus-point wins in the rout. Fenzl trailed Kruz Adamson 10-6 after two periods at 125 pounds but scored three takedowns in the third to force overtime. He added a fourth takedown 31 seconds into the extra period to get the crucial win. Irwin trailed 5-4 after the first period at 133 before pinning Dash Mann with 10 seconds left in the match, earning the first pin of his career. Kiehne moved to 2-0 with two pins when he earned a third-period fall over Austin Pontier at 149 pounds. A junior, Kiehne now has 13 career wins, 12 of which have been by pin. Jason Clark (157), Austin Stotts (165) and DeVaughn Scott (197) earned major decisions and Colby Vlieger (285) scored a technical fall. Devan Berrian added a decision at 141. 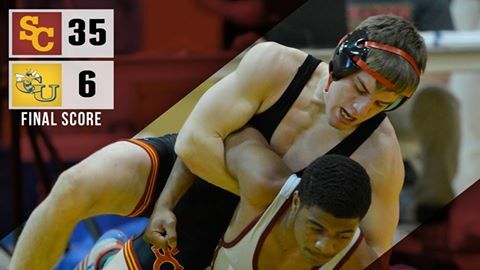 The Storm go to the Luther Open on Saturday, Nov. 12. November 9, 2016 in Division III.